Sports Costs > How Much Does a Foosball Table Cost? Foosball, also known as table football or fussball, is a table-top game which looks much like a miniature soccer field. “Foosball Table” (CC BY 2.0) by .v1ctor Casale. How much are typical foosball table prices? Miniature foosball tables, which usually only have two or three handles to be controlled by each player, will cost only $20-$80. These types of games can be placed on kitchen table, the floor, or even your lap to be played. Mainstreet Classics, for example, sells a foosball table like this for $25 while Franklin Sports sells a 32-inch foosball table for $70. 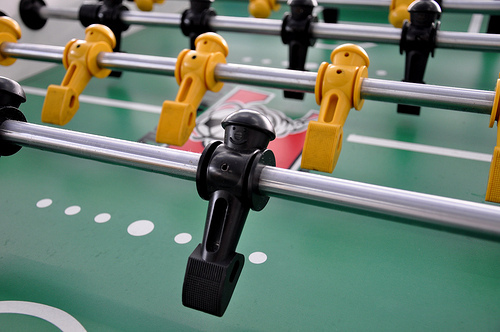 An intermediate foosball table, one that can stand on its own and has three or four handles to be controlled by each player, will cost $100 to $200. Park & Sun, for instance, sells a table like this for $200 while Voit sells one for $125. Tables in this price range will usually not be as sturdy or well-built as the more expensive stand-alone tables. A higher quality foosball table will have four handles to be controlled by each player and will be much higher quality. These types of tables can cost $300 to $2,000. On the lower end, you could find a table like the G01341W from Harvard for $340. In the middle, you could find the Garlando 26-7910 for $700. On the higher end of the spectrum lies the Rene Pierre Super Cup Table for $1750. Foosballsoccer.com did research and found a mini tabletop version can cost $20, while a cabinet style table can cost $4,000. However, the website notes most tables should fit within the $100 to $1,200 range. Foosball tables can come with a myriad of features. This can include hollow steel handles, three goalies, counterweighted men, table levelers, instead of one, a laminate surface and adjustable height settings. Standard foosball table dimensions are about 2 1/2 feet wide by five feet. A regulation sized table will be 30 inches wide, 56 inches in length and 36 inches tall. Foosball tables usually come with 2 or 3 balls. 5-in-1 or 3-in-1 foosball tables can come equipped with other games such as air hockey and billiards. Because the balls used for foosball can be lost or worn down, replacement balls may be required. Most foosball tables can fit ping pong balls, but they are not recommended for game play. Replacement balls can be purchased for around $5 for a set of 4. Replacement players and bars can be purchased as well. These can be used to repair a broken piece rather than having to buy a whole new table. If you’re going to use the table as a toy, consider getting a lower budget based table. This table is going to do more than enough in terms of getting the job done. For those who are shorter or find most tables are too high, some have adjustable tables that can adjust the settings so people can see over. For those who want something such as an air hockey or billiard table, highly consider a multi-game table. The lighter the table is, the easier the table can wear since it can be shifted easier than one that weighs more. Try to look for foosball men with pointed toes for better ball control. If the toes are round, players find it harder to move the ball back and forth. Wooden handles are said to be easier to grip when compared to plastic handles. Plast handles can often cause accidental spins. Adjustable legs are great features to have since you will be able to lower the table to each other’s height. This can create a fair and competitive game. When shopping for size, remember the rods will fully extend, technically making the table wider than what it says. Guage the amount of money you are willing to spend by the amount of use the table will get. If it will only be used once in a while by children, cheaper is better. If it is going to get a lot of use, such as in a college dormitory, maybe spend a little more. Many foosball tables also include other games such as air hockey and pool. These multi-game tables can save money and space in your home. If you’re crafty, consider building your own foosball table.